Supreme Personality of Godhead, Sri Krsna. All glory to Lord Krsna, Govinda, the Supreme Godhead! Glory to His eternal blissful spiritual youthful body! Glory to Him who is the origin and prime cause of all! Glory to Gokula, His supernal abode! Glory to the lotus of a thousand petals sprung from a part of His infinitude! Glory, all glory to Srimati Radharani who stands there beside Him! Glory to the Holy Names! Glory! Glory to the Great mantra of Deliverance! Glory to the cowherd boys and girls, the eternal consorts of Krsna! Glory to the surabhi cows, givers of abundant milk who graze in Vaikuntha! Glory to the Lord of Gokula, the Transcendent Supreme, the very Self of eternal ecstacies! Glory to Him who is the reservoir of pleasure for all the senses! Glory to the Supreme Male, the Purusa, the seed-giving Father of all! Glory to Him of thousands and thousands of heads, eyes, bellies, hands! To Him who is the Source of countless avatars! Glory! All glory to Him whose golden sperm resides in the skin pores of the Great Visnu! Glory to Him who is the object of worship of the hymns of the Vedas! Glory to Him from whom Brahma, Visnu and Siva spring! Glory to Him as God of gods! Glory! Glory! Glory to Him in pursuance of whose order the sun performs his journey, mounting the wheel of time! Glory to Him who lies in an ocean of milk! From whose navel a golden lotus, the abode of Brahma, blossoms! Glory to Him who exhales decillions of universes, inhales then exhales them again and again! Glory to the Eternal Youth who sits on the Divine Throne! To His form of eternal effulgence and transcendental bliss! Glory to His divine flute resonating from the touch of His lotus mouth! Glory to that primeval Lord, the first progenitor! Glory to His abode of gems! To the thousands of goddesses who tend Him! Glory! All glory to Sri Krsna’s figure of beauty tinged with the hue of blue clouds! All glory to His pink-bottom’d feet! Glory to the peacock feathers in His hair! Glory! Glory to His lustrous limbs charming millions of cupids! Glory to His legs! Glory to His arms! Glory to His loins! Glory to His chest, the abode of the Goddess Laksmi! Glory to the garland round His neck! Glory! Glory! Glory! Glory to His eyes! Glory to His teeth! Glory to His throat! His Nose! His ears and cheeks! Glory to His earrings and bangles! Glory to the moons of His fingers! Glory! All glory to His three-fold bending stance! Glory to the gold of His dress, flashing like lightning! All glory to His form of bliss! Glory to His form of truth, substantiality, dazzling splendor! Glory! Glory to His pastimes of love! Glory to the prowess of His arms! Glory to the mystery of His birth in the womb of Devaki! Glory! All glory to His sucking the life from the breast of the Demoness Putana! Gloryto His lotus, conchshell, mace and disc! Glory to His killing Trnavarta, the whirlwind demon! Glory to His childhood pastimes! All glory to His revealing the universe in His mouth to Mother Yasoda! Glory to His stealing butter! Glory to His deliverance of the sons of Kuvera! Glory! All Glory to His killing countless horrendous demons! Bakasura! Aghasura! Sankhasura! Kesi and Vyomasura! Kamsa! Glory to His expansions as the cowherd boys and calves! Glory to His subduing the great serpent Kaliya! Glory to His inhaling the forest fire! Glory to His lifting Govardhana Hill with one finger! All glory to His saving Vrndavana from the torrents of Indra! Glory to His stealing the garments of the bathing gopi girls! Glory! All glory to His holy and mysterious rasa dance! Glory to His entrance into Mathura! To His countless miracles! Glory to His defeating Kamsa’s mighty wrestlers! Glory! All glory to Balarama, His brother, equal in prowess, in strength! Glory to His descent as Nrsimha, half-man half-beast, to destroy Hiranyakasipu! Glory to Him as Varaha, the Primal Boar, who lifted the earth on His tusks! Glory! All glory to His countless incarnations as tortoise, as fish, as Garuda-bird, and horse! As the moon! As Visnu! As Siva! As the celestial serpent Ananta! As the elephant Ganesa! As Yama, death! Glory to His appearance as Vasudeva! Narada! As Vyasa! Vamana! Sukadeva! Lord Rama! Arjuna! Lord Buddha! Lord Jesus! Sankara! Glory to His pure manifestation as Lord Caitanya Mahaprabhu, the most merciful golden avatar, the embodiment of pure love for Krsna! Glory! Glory! Glory to His divine instructions at Kuruksetra! Glory to His universal form of unlimited eyes, mouths, heads, legs, bellies! Glory to the all-pervading effulgence emanating from His Primeval Body! All Glory to His eyes, the sun and moon! To His form that reaches the highest planets, that fills the spaces between! Glory to His fiery mouths that devour all! Glory to Him of unbounded power, of limitless might! Glory to Him as the beginning, middle and end of all! As being, nonbeing and that beyond! As the eternal Soul! Glory! Glory! Glory! Glory to His ever blossoming Youth! Glory to His beauteous name—Krsna! Glory to the Tip of His Toe! Glory to Him in the hearts of all! Glory to Him in His supreme planet! Glory to Him everywhere! Glory, all glory to His Names sung by Gauranga, Lord Caitanya, by His disciples, Haridasa, Nityananda, Advaita, Srinivasa, Gadadhara, by the Gosvamis, Jiva, Rupa, Sanatana, Raghunatha! By their countless followers, all glorified! Glory! Glory! Glory to our grand Gurus, Srila Bhaktivinode! Srila Gaur Kisore! 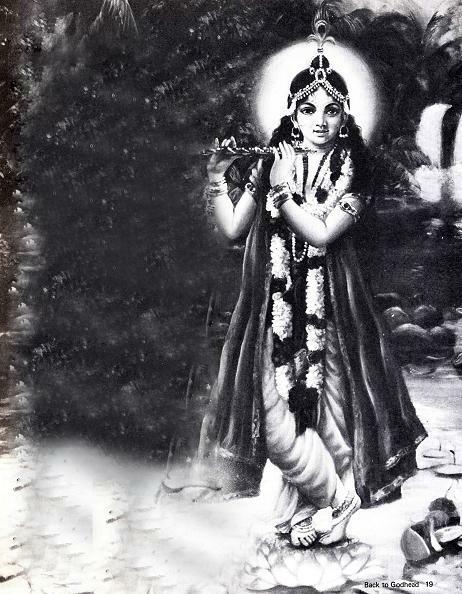 Srila Bhaktisiddhanta Sarasvati! All glories to the assembled devotees! All glories to Sri Guru and Gauranga! Glories! Glories! Glories! All glories to Srila Prabhupada!